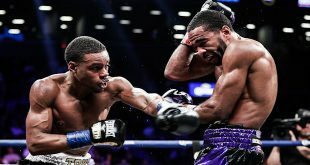 Amir Khan made his American debut a good one as the Englishman successfully defended his WBA light welter title with a dominating win over local hero Paulie Malignaggi at New York's famed Madison Square Garden. Khan, 23-1 (17), was in top form throughout the contest, beating Malignaggi, 27-4 (5), to the punch in countless exchanges, round after round. Former IBF titlist Malignaggi simply couldn't match Khan's skill or punching power but the big hearted New Yorker refused to give up, absorbing a great deal of punishment until the fight was called off at 1:25 of the 11th round. Bolton based Khan has won five straight since suffering a first round KO loss to Breidis Prescott in 2008 while Malignaggi has now lost three of his last five bouts. Khan will likely have to face Interim WBA beltholder, Marcos Rene Maidana, who represents a very real threat to the Brit's title reign. 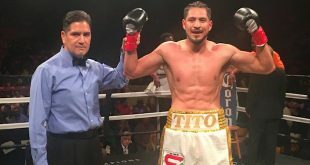 The chief support bout featured former world lightweight champion Nate Campbell against contender Victor Ortiz in a ten round light welter clash. Father Time finally caught up to 38 year old veteran Campbell, 33-6-1 (25), who was floored in the first round before losing a wide points verdict to the big punching Ortiz, 27-2-1 (21). 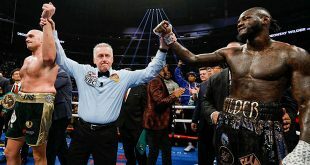 With the high profile win, Ortiz could be back in the picture for another world title shot, a year after suffering a sixth round stoppage loss to Interim WBA light welter titlist Maidana.